Flash Friday is here and since it is Hockey Week here at That F’ing Monkey, today’s blog is going to be hockey related. 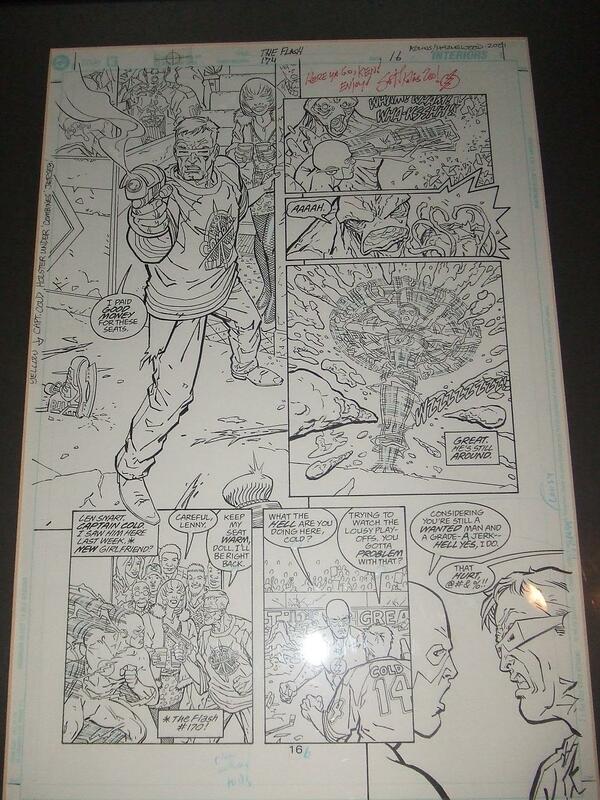 I have talked in the past about how much I liked issue 174 so much that I tracked down some of the page art and bought the page with the fantastic shot of Captain Cold wearing a Keystone Combines jersey. This information will be important later in the story, I promise. So, years ago I’m walking through a Warner Brothers store checking to see if they have anything Flash related buried under all the merchandise for the big three. Sidetracking for just a moment, I really miss the WB stores, I think you’ll see me talking more about them sometime later this month. So anyway, there on the racks are hockey jerseys. 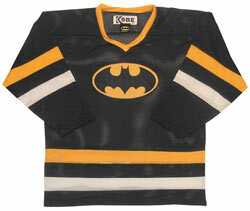 I rush over; slowing only when I notice it seems to be only Batman and Superman who got the jersey treatment. My disappointment eased when I saw how cheaply made they were. They were priced almost like a real jersey, but the quality was not there. Regardless it stuck the idea in my head; I wanted a Flash hockey jersey. 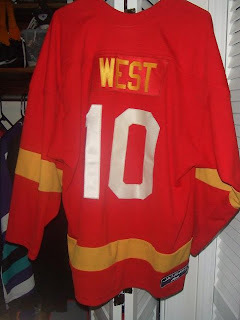 So I started doing research on places that make custom jerseys. I had to look through a lot of places; many of them had minimum orders that had to be met. I didn’t want to sell them; I just wanted one for myself. Now right after I found the place to do it, I had tracked down the Flash page that I wanted to buy. 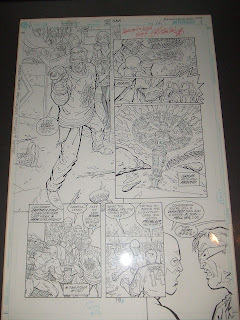 It wasn’t through some art dealer, it was actually Scott Kolins. Since I had his ear anyway, I asked him who was the hockey fan, him or Geoff. From that question talks went to the jersey and all of a sudden the order for the jersey went from one to three. But Scott had one request. He didn’t like the Flash symbol I had used. Having little artistic talent myself, I had just scanned a sticker; he wanted to do the symbol himself. Obviously I didn’t hesitate for a second on that offer. Got all the art work approved, the setup fees covered, and sent it off. After waiting for what seemed like an agonizing stretch of time the box arrived with the jerseys. As you can see from the pictures, they turned out fantastic. My only complaint is they put the wrong number on the back. It was supposed to be 03, I thought it would be clever since we put West on the name plate, not sure how they came up with 10. 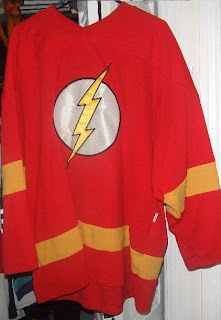 So there you have it, the saga of the Flash jersey. Obviously what I did would violate copyright laws and such. I was lucky who ever worked on the jerseys didn’t notice and or say anything about it. I kept expecting someone to say, "We can't make this, Warner Brothers will sue us!" But the project really was just for me. I never ordered any others after that original run. If I ever get the cash together to do it again, I'm totally getting a Combines jersy made. Oddly enough, I actually have next week’s Flash Friday written, but you'll get no hints. You’ll have to come back next week to check it out. What a fan. Yeah, I'm on Team Wally, too. Your articles always remind me of something that I randomly have in the back of my closet. I had a Flash football jersey made last year before football season began. Got a lot of compliments on it. Definitely need to share pics of it soon. I look forward to Flash Friday every week. Keep 'em coming! I love it! Now if only someone would mass market everything Flash like the big three we would all be happy! Habrown: That'd be pretty cool. I've never met Scott in person unfortunately. The first time I met Geoff I was wearing my jersey. Devin: Sounds great. Can't wait to see them. Mike: I'd like a little more merch, I don't think I want as much as Bats and Sups get. The completionist in me would drive me to bankruptcy.